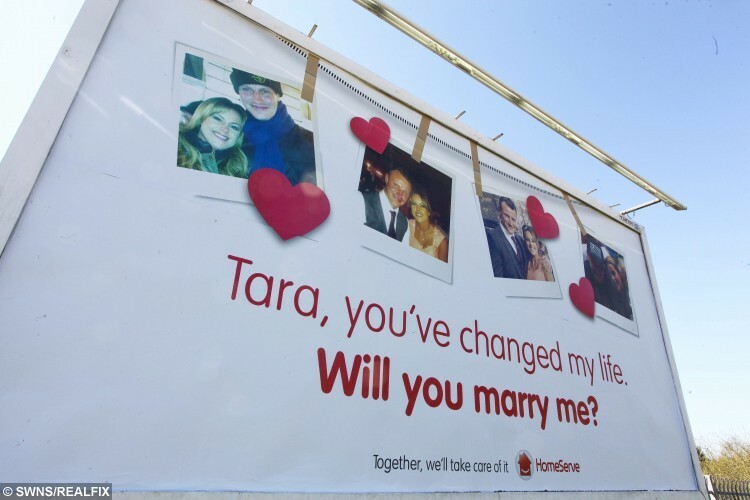 A romantic boyfriend gave his partner the surprise of her life when he asked her to marry him by hiring a giant BILLBOARD at the side of a road she passes on her way to work. Smitten Paul Bakewell, 35, secretly designed a poster which he then had emblazoned on the 20ft-tall advertising hoarding and covered over. The dad-of-one arranged for his partner Tara Barber, 32, to be driven past the billboard by her boss who pretended they were going to a business meeting on Friday morning (17/4). But the pretty hairdresser was left speechless when the car stopped at the 30ft-wide poster on the side of the A34 in Walsall, West Mids. Romantic Paul – who had arranged for friends and family to hide on the other side of the road – then went down on one knee and proposed to Tara, who said yes. Gas fitter Paul, who lives with Tara in Walsall, said he didn’t sleep for two days because of nerves from planning the big surprise. He added: “It was definitely the scariest thing I have ever done in my life. I was putting myself out there in front of so many people but I was confident she would say yes. “I have never been so nervous in my life planning this. It was completely nerve-wracking, I hadn’t slept for two days before Friday. “I had been to ask her dad first to do it the traditional way and her family said she would say yes. “I’m from just down the road and I know Tara drives this way into work in Walsall every day so I arranged for her boss to drive her there pretending they had a meeting. “When she arrived she was so shocked and I think more nervous than me when she realised what was happening. “She didn’t have a clue. I thought it would be something special to make a grand gesture. Mum-of-one Tara, who has a son Carrick, six, from a previous relationship, added: “It was totally clueless, it was the best kept secret. “My boss pulled over and I thought there had been a car accident because there were so many people by the side of the road. “Then she started crying and I saw the billboard and my legs just went to jelly, I couldn’t feel them at all. “I had no hesitation to saying yes. It was incredible, we’ll never forget this. Paul left the house at 4am on Friday to help put the poster on the giant billboard – telling Tara he had been called out to an emergency gas leak. When he originally planned the proposal, he was disappointed to find out that the advertising space had been bought up for several years by Homeserve. But the national home assistance company agreed to let him use the advertising space outside their call centre at no cost and even helped him create the romantic poster. A big crowd of family members and friends who had gathered on a green opposite the billboard to watch the proposal cheered and tooted horns after Paul got down on one knee and an emotional Tara said yes. Paul, who has a daughter Ellie, 11, from a previous relationship, added: “I knew there was a billboard and I started looking into how I could pay to take out a poster two weeks ago. 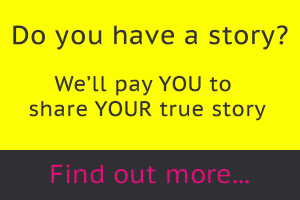 “But when I inquired I found HomeServe had bought the space so I approached them. John Greaves, HomeServe’s Director of Corporate Affairs, said: “We were as surprised as Tara to receive the call from Paul with his unusual request, but we were only too happy to assist and take care of this for him.